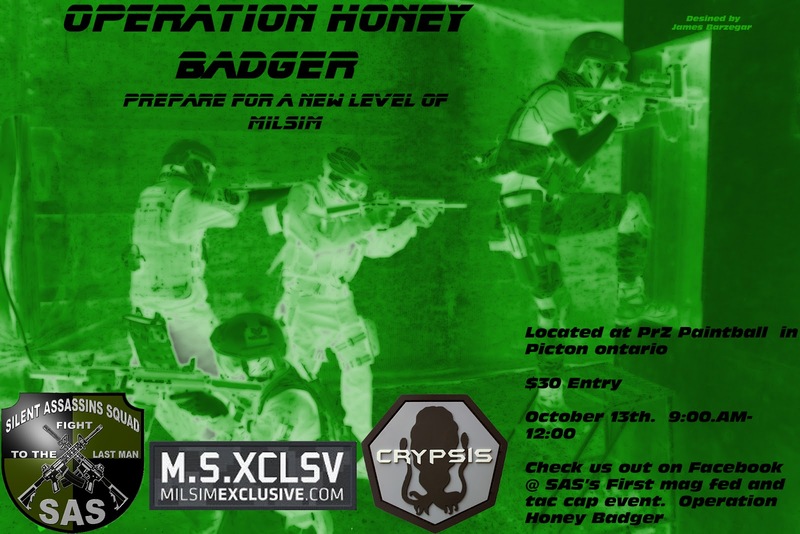 In what will be SAS Woodsball Canada's first organized mag-fed and tac-cap only game, Operation Honey Badger brings a day long scenario to the famed PRZ facility. Players and teams that have been stockpiling their limited capacity markers and gear will get the chance to play with Ontario's best, in what's shaping up to be an amazing event. This will be SAS's First mag fed and Tac cap game ever. The scenario goes as follows: A large shipment of chemical weapons was located in southern Ontario, Canada. The origin of the weapons were confirmed to be Russian. J.S.O.C has assembled a JTF2 Team lead By Brad Stirton to secure the weapons depot. A large number of hostiles has been reported in the area. Intel shows that the hostiles are members of a P.M.C company named Acinaces Dente lead by a Major Alex "Too Tall" MacLeod. It is imperative that Major MacLeod be captured and questioned. Operation Honey Badger has begun. Oh yeah, Crypsis will have a booth there as well. I hear the owner of that business is quite attractive, would probably be worth going just to get a look at him.